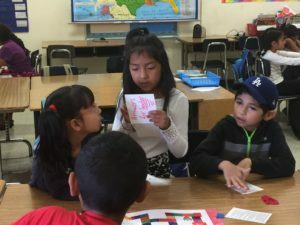 Los Angeles Unified's Hoover Street Elementary leaders have transformed what had been a struggling neighborhood school into one of the gems of the District through a six-year partnership with Principal’s Exchange, an education consultant that empowers teachers to transform their instructional approaches. Just one indicator of their success: 53 percent of Hoover Street students scored proficient or better on the state’s most recent English language arts test and 48 percent hit that mark on the state’s math test. Those numbers outstrip other neighborhood schools, as well as county and state averages. Principal’s Exchange guides schools in creating systemic changes to instructional approaches. PRINCIPAL’s Exchange provides customized solutions for schools and school districts to support educational equity and excellence. Using its “Response to Intervention for Systems” (RtI4S) methodology, a research-validated school and district-strengthening model, PRINCIPAL’s Exchange provides technical assistance, professional development and coaching for teachers and administrators, and develops software tools to enable the use of data to drive student performance. The Educational Results Partnership (ERP), a nonprofit agency that honors higher-performing schools, has recognized Principal's Exchange for its approach to improving student outcomes at East Whittier City School District in 2015-16. The educational consultant is cited five times for inspiring best practices for how teachers gather and respond to student performance data – considered a factor in college and career readiness. ERP creates an annual Honor Roll of high-performing schools and districts, highlighting best practices in an online report in collaboration with the Campaign for Business and Education Excellence. The November 2016 edition of Educational Leadership magazine will feature an article by two Principal's Exchange leaders explaining how data analysis can reveal why some students fail and how educators can correct those outcomes. The article, by Principal’s Exchange CEO Robin Avelar La Salle and Senior Data and Equity Consultant Ruth S. Johnson, is part of the magazine's focus on "disrupting inequity." Principal's Exchange empowers educators at historically underperforming schools to use data and collaborative practices to enact systemic changes that boost student achievement. Educational Leadership, with a circulation of 135,000, is the flagship publication of the Association for Supervision and Curriculum Development. Principals Exchange, which guides historically underperforming schools in boosting student achievement, is highlighted in a groundbreaking new book by the late Robert C. Calfee, a professor emeritus of education at the Stanford Graduate School of Education, and Kathleen M. Wilson, an associate professor emerita at the University of Nebraska-Lincoln. Principal’s Exchange is cited as a bright spot by “Assessing the Common Core, What’s Gone Wrong – and How to Get Back on Track” for applying research-based strategies that target systemic issues and empowering educators to use data to accelerate achievement. Principal’s Exchange guides California schools responsible for educating more than 30,000 students. Follow-up Story: A recent visit to LAUSD’s Union Avenue Elementary School by State Superintendent of Public Instruction Tom Torlakson highlighted the school's vast success at improving outcomes for English learners. Under the strong leadership of Principal Veronica Herrera Lynch and the hard work of teachers and staff, the school worked with Principal's Exchange to strengthen its research-driven approach to accelerating achievement. The August tour mirrored a visit by Torlakson in 2015-16 to East Whittier’s Ceres Elementary – another school that contracted with Principal's Exchange – where English learner achievement also is soaring. Principal's Exchange specializes in empowering educators at historically low-performing schools to remove systemic barriers to success, relying on data to focus instruction. Principal’s Exchange, a leader in promoting student achievement for historically underperforming schools, has appointed four leading education experts to its newly formed Advisory Board. Among the appointees is long-time schools administrator Jerry D. Weast, whose groundbreaking education strategies are chronicled in studies by Harvard Business School, The Pew Foundation and the Carnegie Foundation for the Advancement of Teaching. The board will serve as a strategic resource as the PE Board of Directors seeks to scale up its education consulting and software offerings to benefit more students. THINK Together and Principal's Exchange, statewide leaders in innovative instruction models and educator professional development, announced Monday, Jan. 26 that they are joining forces to aggressively tackle the issue of education equity and instructional improvement, particularly in districts with large populations of at-risk students. The partnership comes at a time when school districts are grappling with implementation of Common Core State Standards, Smarter Balanced testing and the Local Control Funding Formula – state mandates that will ultimately benefit students. However, launching the programs has been overwhelming for many school districts. Through this partnership, the two nonprofit groups will provide a full complement of resources for schools as they develop new instructional models and tools to deliver a 21st century workforce.